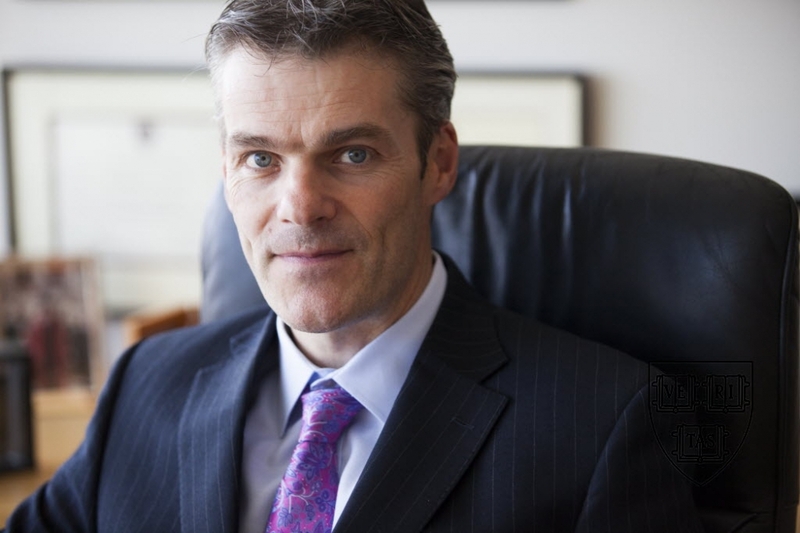 In his first annual letter, disseminated in September, Harvard Management Company (HMC) president and CEO Stephen Blyth described both sluggish recent investment returns and—far more consequentially—significant changes in asset allocation and investment management for the University’s endowment. Several weeks later, he invited Harvard Magazine to visit HMC’s offices, in the Federal Reserve Bank tower overlooking the harbor in downtown Boston, to discuss the evolution under way at the organization. That evolution, he explained in detail, was driven by challenges in the investing environment at large—and by significant issues internal to HMC and Harvard. Following his assessment of past challenges, Blyth looked forward. He described the origins of HMC’s new mission statement; quantitative investment-return and -performance objectives; and a new asset-allocation process that, among other attributes, encourages fresh investment ideas and approaches at a time when competition has made it more difficult for all institutional investors to achieve high real returns using strategies that worked a decade ago. Ultimately, it’s all about those investment objectives. I can’t say, “I’ve missed our investment objectives but I’ve saved this amount of money in management fees,” right? Our investment objectives do not include minimized management fees. They’re not there. A lightly edited transcript of the conversation follows. Harvard Magazine: The point of departure in your letter is seeking improved investment performance—and you are at pains to explain that aggregate out-performance has lessened, that performance relative to peer institutions’ endowments has lagged. When you looked at what had happened, how do you sort out, on the one hand, internal execution and selection of outside investment managers, from the many external factors you talk about in a changing world—a different external environment? They both are at play—how do they rub up against each other? Stephen Blyth: I talked briefly about each of our three investment objectives and how each of them has been on a declining path: long-term real return, downward trend; relative out-performance versus market indices and industry benchmarks, downward trend; and relative performance versus peers, downward trend. Those investment objectives are all written up here on my board actually: delivering a real return of 5 percent or more; achieving 1 percent outperformance (relative to market and industry benchmarks); and being in the top quartile relative to the next 10 largest university endowments. Now, they’re all interlinked in slightly different ways. The latter one really should be orthogonal to any market conditions, because we’re all under the same market conditions. So, in some sense, the latter performance metric is more of an indicator of executional issues—investment process, manager selection decision-making, portfolio construction, asset allocation, et cetera: all the things that make up investment decision-making, plus in that latter one, factors that have affected Harvard idiosyncratically [see discussion below] relative to that other peer group of 10. Actually, people say 10, that’s too small a group, but those numbers look very similar if you compare Harvard against the largest 20 endowments, which take you down to about $5 billion [in assets under management]. So this metric, I would say, speaks much more toward execution and idiosyncratic Harvard-related issues. As a statistician, having done an analysis and thinking about explanatory variables and thinking about decision points and thinking about conditions, I recognize that a lot has been written about Harvard during the financial crisis and subsequent consequences which have played out in a number of ways. Those issues impacted our ability to deliver on the third investment objective. For the first two objectives, I think [the role of internal performance versus external conditions] is a fair question. On the first one, the 10-year rolling average real return declined from double digits to just over between 5 percent and 6 percent annually. That is highly related to the fact that interest rates have declined dramatically over that period. I mention in the letter that 10-year, essentially risk-free real rates have declined from 4.5 percent to 0.6 percent and 30-year real rates are now one point something percent. In order to generate 5 percent real return 10 years ago, you could just buy mostly TIPS [inflation-adjusted bonds] and then take a little bit of risk. Today, you need TIPS plus 4 percent of real return [from taking risk], so, clearly, that must be harder to do. One could also say that the lowering of real returns has some execution element to it. Relative return, the second objective, I always feel is more nuanced—has a different set of factors applying to it. To me, it’s the opportunity set to outperform markets. I think a jury of 12 reasonable people would say that the opportunity set to outperform markets is less rich than it was certainly in 2000, or it is harder, or there are more people trying to do it or the universe of potential mispriced parameters or dislocated markets is more closely examined versus 15 years ago. I’m sure if you ask Jack Meyer [HMC’s president and CEO, 1990-2005] that question, he would say, “Your job in that regard is much harder,” because in the late 1990s, early 2000s, which was the time when HMC had its optimal out-performance relative to market indices, the competition from hedge funds, the capital in hedge funds, et cetera, was much lower. It was clear that HMC in the late 1990s/early 2000s was outstandingly good, where they had essentially very, very smart investors here with less competition. That environment has certainly changed. But equally, we can ask, have we been executing less well in the last five years? Certainly, I believe we have room to improve on that front. So, for the second element—how much is execution, how much is market?—I’d say that’s more balanced than the real return. Again, this is qualitative, but reduction in real return is a market-wide phenomenon. Reduction in our relative performance is more balanced. And then reduction in our standing versus peers is heavily an execution/Harvard issue. It’s almost like there’s a spectrum across those. HM: You’re trying to deal with those different circumstances to get a better outcome. Take me through your thinking about the problems that poses. What paths are you pursuing, to respond? Stephen Blyth: Actually setting out those investment objectives, as described in my letter, was an extremely important step to improving performance. We’ve now got very well defined metrics of success, but in order to improve what qualitatively has been generally viewed as disappointing returns, we do need at least to have well-defined objectives. That was actually a non-trivial exercise, to understand what those objectives should be. They really did flow from the re-statement of our mission. The mission, which had been superior returns over the long run for Harvard, which is noble and correct, still holds. But it didn’t actually define success. We have delivered high returns for Harvard over the long run, but then we’ve also been generally viewed as under-performing peers over the last five or six years. It wasn’t clear. Many investors would say an annual horse race against other investors is just highly detrimental to long-term investment performance, which speaks to why all these objectives are for a minimum of five years. A number of my staff said, hang on a sec. First of all, I’m supposed to beat my benchmark, and then I’m supposed to deliver over 8 percent or a planning assumption. We’ve done both of those, but now I’m supposed to beat Yale, too. Where did that come from and how do we actually clarify and get clear in people’s minds why that might be important—and should it be? So, we had that discussion. Many investors would say an annual horse race against other investors is just highly detrimental to long-term investment performance, which speaks to why all these objectives [discussed above and spelled out in Blyth’s letter] are for a minimum of five years. So, setting the mission correctly is important [It reads: To help ensure that Harvard University has the financial resources to confidently maintain and expand its preeminence in teaching, learning and research for future generations. ], even though it is a bit of motherhood and apple pie. It’s actually worded very carefully so that the investment objectives in some way drop out of it automatically, or at least are consistent with it—to provide the financial resources so that Harvard can maintain its preeminence. Why did we add that “confidently”? Well, we can’t guarantee, because there’s obviously going to be some risk. “Future generations” clearly means we have to maintain the real purchasing power of the endowment, so we need to be making a real return after whatever we’re distributing to the University. The distribution rate has slowly ticked up over time. Over the last five years, I think it’s averaged 5 percent. Over the last 20 years, maybe 4.3 percent. Hence the 5 percent real return target, and at a minimum 5 percent, because we’d ideally like the real value of the endowment to increase, not stay static. That’s number one. Then, to maintain Harvard’s preeminence really gave us intellectual clarity about having a peer-comparison element to our performance, not as a response to the score sheets on the front page of The Wall Street Journal, but, ultimately, if over the last 10 years we were 1.1 percent behind Stanford, 2.3 percent behind Yale—if you think about the institutions with which we compete for faculty and staff, if they end up with larger endowments, that has a significant effect on Harvard’s ability to be preeminent. So that is actually very important to have out there. That actually tied in to the first thing I did here, which was set the new narrative for HMC. I viewed it as setting a new path or setting a new narrative—not drawing a line under the financial crisis, but at least starting a new paragraph or new chapter. I communicate with my staff largely through town halls because I think it shows conviction. We have 260 people here and they can all fit on one floor, and I’ve had probably eight town halls since I’ve become CEO, and the first one in early February was this shift of narrative, which was: let’s recognize that Harvard had a tough war, had a very difficult financial crisis, and its liquidity position was worse than other comparable institutions' for a number of reasons that you’re well aware of. The liquidity was worse in a very critical period. Jane [Mendillo, HMC president and CEO, 2008-2014] was a magnificent leader through that crisis, she stabilized the situation. She rebuilt the organization, which had been decimated by spin-outs [departures of investment professionals to start their own asset-management firms, often funded in part with assets managed for HMC] and turnovers of CEOs, and so on. She improved liquidity, improved liquidity at the University, and generated double-digit returns. Let’s etch those real accomplishments into stone, put them on a tablet and recognize them. But then let’s realize the following: that our investment performance over the last five or six years has been lagging peers who are trying to do the same things as us. We’ve been 2 percent behind Yale, 1 percent behind Stanford. We’ve been bottom of the Ivy League three out of five years. Our return has roughly equaled that of the NACUBO [National Association of College and University Business Officers] mean return, but has been below the TUCS [Wilshire Associates Trust Universe Comparison Service] median for five years. Let’s just recognize that—and let’s realize that our job is to improve investment performance. This is the new path. This is about moving from recovering and qualification to competing. Interestingly, there was a sense of relief from the organization that that was just said publicly, internally. This is the new path. This is about moving from recovering and qualification to competing. That’s almost a mandate that I had as the new CEO. So the first step to achieving this is to ensure that everybody at HMC is aligned with high performance, being competitive, being best in practice, et cetera, rather than being in the mode of, yes, things are challenged at Harvard: we’re in recovery, if our performance somewhat lags, that’s just a function of how we’re in crisis recovery. The analogy that I’ve used a lot is a soccer analogy. I’ve tried to find an American sport analogy, but then I realized it would be completely inauthentic for me to try to make an American sports analogy. A soccer analogy is that in the months and years following our financial crisis, HMC was necessarily in what I’ve called “qualifying mode.” England always qualifies for the soccer World Cup—to do that, you just need to beat Lichtenstein, beat San Marino, beat Estonia, and maybe not lose to France once and then you qualify for the World Cup. In order to do that, you need to have players behind the ball. You need to minimize risk. You need to make sure you don’t give the ball away. You don’t want to move players forward; you certainly don’t want to move too many players forward and run the risk of someone scoring against you, and you’ll qualify. If you get to the World Cup, you need to compete. If you’re just in qualifying mode, you’re going to get nowhere—and that’s what always happens to England: they always get knocked out in the first round or the round of 16. In order to compete, you need to be prepared to take appropriate risk. You need to be able to move players forward. If you have the opportunity, say someone’s gone down the right wing and is about to cross, you need someone in the box ready to head the ball into the net. If you don’t have someone there to take advantage of the opportunity, you’re not going to score. It doesn’t mean play recklessly. It doesn’t mean moving all players to the front and being hit on the break, but it’s a different mindset. It also involves having everybody on board with tactics and strategy. That analogy only stretches so far, but if there’s some encapsulation of what I’m trying to do in terms of the culture shift here, that analogy is good. I would say that being in qualifying mode was truly appropriate for HMC from July 2008 for a number of years. However, as an organization, one has to guard against culture becoming cumulative or becoming in-built, imbued either subliminally or subconsciously. I know how bad things were, it was absolutely appropriate in early 2009 to say to people, do not do this investment that could lose this amount of money because our liquidity constraints are so intense that that would be very damaging to the overall position of the University—a right decision to have made. If I’m an investor at HMC in 2009/2010 when liquidity across the University is still very tight, the swaps are still on and we’re still posting a lot of collateral, the central bank still has units invested with HMC [Harvard’s pool of centrally managed cash and other funds, much of which was invested in relatively illiquid endowment assets in the middle of that decade], if I’m going to invest, even if there’s an opportunity, I need to make sure that it does not show up on the downside if something goes bad, so that means a sizing issue. I need to do it on a smaller scale. As a direct result, it’s not going to show up on the upside if things go well. So, there’s a conviction-to-scale mismatch. If we think about one sort of explanatory variable about why others recovered in a different way than we did over the last five years, it’s the conviction-to-scale mismatch. Even if we were making the same decisions, we were doing trades in 50 or 100 lots for a $30-billion endowment and others were doing 100 to 200 lots for a $20-billion endowment, which is probably appropriate. Say we wanted to do a one-percent investment in a high-conviction manager or asset, we were doing a quarter- to half-percent investments where others were doing one- to one-and-a-quarter-percent investments, so that is something that we need to shift. I talk a lot about conviction and building conviction to scale. The natural follow-up question would be, how does one build conviction? That’s about investment debate, dialogue, challenge—and that speaks to reinvigorating the investment discourse at HMC, introducing the investment committee, reengaging with a lot of external managers, peer institutions, et cetera. There’s a whole range of really engaging and fascinating and interesting things that we’re doing, that all investors love doing, that we can now do because we’re in that position where we do want to build conviction—and if we do, we can do things in the appropriate scale. When I use that analogy, people have often said, does that mean it was conservative and now you’re going to be aggressive? I said, no. Now, we’re just going to take advantage of the appropriate risks when the opportunities present themselves. I’ve been very clear to the board and very clear to the company that we’re not doing a hypercorrection here. This shift is not one of now we just do things bigger and take more risks; it’s just getting back to the appropriate investment culture for HMC. HM: On a specific point about execution and selection: in the most recent letter, you obviously talked about the disappointing results in absolute return [HMC’s category of assets invested in hedge funds]. Over time, HMC has done very well in managing public securities, and the things that stand out mostly relate to private equity and absolute return—some of the big categories of investments managed externally. Those typically had positive returns, but they’ve typically lagged other institutions’ performance in those classes. Holding aside the overall analysis you talked about, are there particular HMC concerns about access to such investments, manager selection, or other issues in private equity and absolute return? Stephen Blyth: The answers are slightly different for each asset class, but they also have similarities. Let me broadly say one of the things that, again, is somewhat a manifestation of the response to the financial crisis: in the years following that, HMC retrenched significantly and in a number of ways. It was unable to give capital to subsequent funds from high-conviction managers simply because our liquidity constraints were so tense. We sold certain interests at a discount, as is well documented. As a result, the relationships with private-equity managers as a particular case were affected following the financial crisis. Again, I think those decisions, you could understand those being taken. But the relationships that we have with the top-tier private-equity managers and venture-capital managers are just incredibly valuable. Those are assets that need to be managed and looked after in the same way we would look after financial assets. That’s an area that I personally, the executive team, the private-equity team are highly focused on—developing those relationships back to a place where they are valuable assets. That’s been a focus. How does one go about building relationships? It takes time. Just putting my statistician hat back on, you can regress performance against a number of different explanatory variables. If the explanatory variable is the number of CEO turnovers, it’s very interesting. This year the bottom-performing Ivy League school is Cornell. I think it’s had more CEO turnovers than we have. But I had breakfast yesterday with Andy Golden [president of Princeton University Investment Company]. He’s been there 20 years. I’m the sixth CEO at HMC since 2005, including the two interims, Peter Nadosy and Rob Kaplan. Relationships can’t be optimized when there’s turnover in the CEO’s seat. I’m the sixth CEO at HMC since 2005, including the two interims. Relationships can’t be optimized when there’s turnover in the CEO’s seat. We did the same with private equity in the summer: 13 private-equity managers in a room with our private-equity team, and, of course, there were individual meetings. The same with hedge-fund managers in New York: we went to see founders of some of the high-conviction hedge funds. Building the relationship is so important for us to really develop conviction in the managers and understand—it just helps us in the execution of manager selection. The question about those returns being positive but lagging—it relates to continuity of personal relationship and capital relationship. We’ve had gaps in both of those. All investment managers want their LPs [limited partners: the investors whose money they manage] to have a good relationship, to be able to discuss investments and so on. But they want them to be consistent capital partners with them. That’s something that we will strive to do in the future. [By the way], I’m actually a believer in the value of an absolute-return portfolio [a subject of some debate in institutional-investment circles of late], and our absolute-return portfolio, especially in this kind of market environment with equities generally fully priced, private equity at high valuations, some venture capital at extreme high valuations, et cetera—so the value of the uncorrelated return stream, if it exists, to me is only higher in this environment. Last year it performed poorly. It’s an interesting analog in the same way that there was a huge dispersion of returns across different asset classes and managers, across all endowment space: so some biotech funds were up 70 percent, some venture-capital firms were up almost 200 percent, some emerging-market equity funds returned minus 10 percent. It was the same within our absolute-return portfolio, we had a very large dispersion: some funds were doing extremely well, some funds were doing poorly, and overall we did poorly. But the value of that portfolio, to me, in this environment, of having an appropriate portfolio, is high. HM: When I reported on your letter in September, I think I misunderstood, or didn’t represent appropriately, the wide-ranging classes that you presented for HMC’s asset allocation for this fiscal year. Perhaps you want to talk through how you’re trying to move from certain kinds of asset “silos” toward different kinds of investment discussions across classes, and then applying that in a given year? Stephen Blyth: Let’s talk about the new asset-allocation approach, its origins—not too much about the technicalities, but what it means in practice. The origins are important. Again, the retrenchment that was necessary at HMC meant that we had not reviewed our asset-allocation approach thoroughly. We’ve actually reviewed it, but we have not completely overhauled it or taken a big-picture view. It’s not as if it was just put away and black-boxed for many years; I don’t want to mischaracterize it. But to me, the process had become ossified in the sense that we were using a very standard mean-variance approach: put in capital-market assumptions, return assumptions, volatility assumptions, and correlation assumptions for the 12 or 13 asset classes, run it through a mean variance, optimize it to get an efficient frontier, and then either pick the required return and a risk comes out or pick a required risk and the return comes out. It was mathematically rigorous, but it had been ossified. There are many problematic issues. One is that the inputs are highly uncertain. A five- or 10-year return assumption for a number of asset classes is just, who knows? Probably the most researched topic in financial economics is the equity-risk premia—we have the experts sitting up in Littauer, like [Olshan professor of economics] John Campbell, and [Bates professor] Luis Viceira at Harvard Business School. There are some researched topics, but if you think about what’s the 10-year return on natural resources or private equity, it’s hard. As a statistician, I appreciate that estimating correlations is probably one of the hardest things for humans to do or understand. But more problematic is, what are the covariances between them? As a statistician, I appreciate that estimating correlations is probably one of the hardest things for humans to do or understand. You can do it, obviously, just empirically from data, but the data are nonstationary; they change over time. It’s just highly uncertain: even if you had an estimate, the standard error of the estimate is vast. Purely just reviewing what we were doing, we realized it made no sense to come out with point estimates, individual numbers, for the individual asset classes, because there was vast uncertainly about them. One of the things that I remember clearly was my first day on the job here, the second of January, which was a University holiday. There were about 20 people here. Then on Monday when I came in, there were 270 people here and that morning, I brought in Jake Xia, our chief risk officer and 20-year veteran of Morgan Stanley, with a Ph.D. from MIT, and I said, “We need to overhaul our asset-allocation approach,” and he said, “I totally agree.” So we started a project that was very thorough, led by Jake and his senior vice president, Mark Szigety, who has a D.B.A. from the business school. The three of us—mostly the two of them, I did little more than just adding direction—did a thorough review of the literature, of the experts, of peer institutions. There’s a vast literature. There are also many, many different approaches to asset allocation from the different institutional investors. I thought, okay, we’re taking on something really onerous here—this is a big mountain to climb. I banned the phrase at HMC, “This is a good investment for the endowment but it doesn’t fit.” That to me is an oxymoron. They did a great job and we had some direction as we went. First, we wanted something that was flexible at the end. We cannot have an answer that is just a point estimate, because we have to be incorporating uncertainty along the way. Second, we wanted something that did not prevent us from doing investments that were good for the endowment, so I banned the phrase at HMC, “This is a good investment for the endowment but it doesn’t fit.” That to me is an oxymoron. We also wanted to be more comfortable about any assumptions or forward projections. We needed to feel more confident about those than we did about this 13-by-13 covariance matrix, about which we had no confidence. As we looked at the various approaches, there’s a very simple approach called a “reference portfolio.” It says, essentially, the capital markets are made up of 60 percent equities, 40 percent bonds, or 65 percent equities, 35 percent bonds. That’s your passive portfolio. Anything you do needs to beat that. If you’re going to deviate from 65/35, show me why it improves risk/return characteristics. That’s the reference portfolio. The second approach was just pure bottoms-up or the “best-ideas” approach, which is just do what you think’s good: just look for great investments. I think there are some other institutional investors that do that. There’s a third approach, which is different from where we are. It’s factor-based investing, where you look for where are risk premia? What are the factors that drive returns? That, itself, is a huge topic. What are the factors that generate returns? Those can be either standard risk premia, like equity risk premia, or they can be style factors, like value or momentum. One then maps your asset allocation in terms of factors as opposed to asset classes. It’s a different approach. There’s much debate there about, are factors asset classes or are asset classes factors? There’s a whole academic debate, but at least it’s a new way of looking at it. So, we thought, there are lots of different advantages to all these methods. What came out in a period of several months is we distilled out a lot of the benefits of each of these different asset-allocation approaches, because we felt it was getting the best out of each of them. First of all, we said, a reference portfolio is very simple: equities and bonds. But it’s too restrictive because you can’t actually span basic risk premia just from equities and bonds. It gets very complicated. How do you express a hedge-fund investment in terms of equities and bonds? So we said, can we expand the reference portfolio to have maybe five key risk drivers instead of two? That becomes more of a factor approach, so that’s why we ended up with the five factors: equities, bonds, credit, inflation, and currency. Then that allowed us to apply the rigor of mean-variance optimization to the five factors. To do that, we just need return and covariance assumptions for five factors rather than 13. It’s still a difficult estimation problem, but we can do that. That was the first stage: an optimal allocation of these five factors. We do believe we can do better because we think there’s excess return in private equity, in venture capital, in hedge funds. If there weren’t, we wouldn’t be doing it. However, we can implement those optimal five factors with a whole range of different asset classes. We might believe we can do no better than doing equities, bonds, credit, and inflation—but we do believe we can do better because we think there’s excess return in private equity, in venture capital, in hedge funds. If there weren’t, we wouldn’t be doing it. So the next step is saying, of the return from, say, private equity, how much is explained by equities, bonds, credit, inflation, and currency; and how much is residual return and residual risk; and how much illiquidity is there? That’s what we call mapping the asset classes to the factors. We still have this five-factor base and then whatever [the investment], we map the asset classes to the factors. It doesn’t have to be an asset class we’re mapping; it can be any investment we like. Here’s where the flexibility comes up. If we see some big investment where we are investing in land but we may be able to grow crops and then generate biomass that we can burn to generate electricity, what is that investment? It’s a whole lot of different things: it has private equity, it has energy, it has land, but in order to incorporate within our portfolio, all you need to do is take out the five systematic factors and understand what’s the residual return and residual risk. Finally, there are obviously infinitely many portfolios that satisfy those five factors. That’s the “I” for “Indeterminate” in FIFAA [Flexible Indeterminate Factor-Based Asset Allocation, the name Blyth, Szigety, and Xia have given the process]. This method does not come up with one solution. This indeterminacy—I rather embrace it. What we said is, there are many what we call permissible portfolios, combinations of assets that give us the appropriate five factor risks—the appropriate equity, bond, credit, inflation, and currency risks—but have all sorts of other, different characteristics. Let’s just optimize for maximum residual return, minimal residual risk, and some illiquidity constraint. Even with all those, then there are many portfolios that will satisfy that. An additional step that leads to the type of asset-allocation ranges described in the letter is an acknowledgment that this process has uncertainty—and how do we capture the uncertainty. What we wanted to do is explicitly capture the uncertainty, so we added error to the mapping of each asset class to the factors. We said, “Of course we don’t know exactly what that mapping is, so let’s put some error in there and then re-run the optimization.” That will give you a range of possible portfolios and explicitly give these ranges of the individual asset classes, which are the fifth and ninety-fifth percentiles. All we’re saying is that for the set of permissible portfolios, some of them have private equity at the maximum level and if they do, they’d probably have public equity much lower. There’s a whole range. That gives us flexibility to operate, but then it behooves us now to actually think more deeply about our overall allocation of our capital. Before, if you had a point estimate—12 percent domestic equity, 11 percent foreign equity, 9 percent emerging market equity [an asset allocation like that in HMC’s prior “policy portfolio”]—if you state that, even if the board or our mandate says you can deviate from that (which it does, as it should), it’s hard to deviate from that because of the natural pull to that [allocation]. Whereas if we’re explicitly saying we have this flexibility, all these portfolios are permissible, it allows us now to incorporate the best-ideas concept. I think that’s something that is going to be additive going forward. We no longer have things falling between the gaps. We’ll no longer be having, “This does not fit in my bucket” or “My bucket is full; I can’t fit any more in.” Things that are just suboptimal from an investment perspective yet are natural results from a fixed asset allocation are no longer in play. That’s such a shift to actually get people thinking along these lines; it takes time. The investment committee is the driver of all these decisions, but the mechanisms for implementing this are still being developed. HM: And then you have a more refined allocation for the year, a tighter allocation than these ranges? Stephen Blyth: Correct. That basically tells people where we feel we can deviate given the capital-market assumptions to the main factors, given the mapping, and we will deviate from there as the opportunities present themselves. HM: In your letter, you then discussed the investment process, which obviously ties into the kind of culture you’ve been talking about: discussions across asset classes, collaborations, partnerships, and vehicles, new ways of doing things, and investing at scale. For a lay reader, can you give any examples? Stephen Blyth: We have changed the investment-management structure at HMC in an important way. We’ve essentially taken out a layer of investment management. Under Jane Mendillo, I was head of public markets, Andy Wiltshire was head of alternative assets. Andy then had four asset classes reporting to him. I had public equities, public credit, public commodities, and public fixed income reporting to me. The debate across that second layer and what was then a third layer was low and to me suboptimal. When I became CEO, I didn’t replace myself. Andy retired and is now back in New Zealand, and I’m not replacing that head of alternative assets role. In some sense, as CEO, I dropped down to sit on top of the investment committee, which is now the portfolio-management heads. That means the discussion is less vertical and more horizontal just by construct. That changes the decision-making process significantly. The discussion is less vertical and more horizontal just by construct. That changes the decision-making process significantly. What does that mean in practice? For instance, one of the biggest shifts in the U.S. and world economy is shifts in energy production and energy supply, driven mostly by increased U.S. supply of crude oil but also natural gas. A significant impact on geopolitics is essentially the reversal of the pipeline. It used to be crude oil came through Louisiana, was piped up to Cushing, Oklahoma, and then distributed out. That’s been reversed because the U.S. is now exporting or will export liquefied natural gas (LNG), so the pipeline is now going down from Cushing and pipelines are reversing, going to the Gulf. There is an interesting investment opportunity about storage in the Gulf because they’re waiting for things to go out. The whole dynamic is changing all the time: the story was LNG will completely decimate coal in Asia, which would be positive from an environmental point of view, but then coal has gotten so cheap that LNG needs to get cheaper. That is a huge shift in the U.S. and world economy. It’s a huge shift in where capital goes. Think of that in isolation—we’re just going to look at debt of companies that are building LNG plants, or just equity of companies that are going to ship the LNG from the U.S. to Europe. It’s suboptimal. Having that cross dialogue—whether it’s in the private-equity space, debt, public equity, whether it’s with external managers—just understanding how that plays out across the capital structure and different asset classes, it’s incredibly important. Another fascinating example is biotech, which is obviously a hugely transformative field. Prices of biotech stocks have been highly volatile for a number of reasons. It’s an incredibly volatile and tricky area. But if you think about the growth in biotechnology led by Harvard, MIT, Stanford, the things that the Wyss Institute [for Biologically Inspired Engineering, at Harvard] is doing, you think about that ecosystem from scientists at the Wyss coming up with an idea, getting the patent, maybe getting some funding internally for developing some ideas, then needing mid- to late-stage funding from venture capital, then needing public funding when they do the IPOs after clinical trial X, and then they need lab space. You can’t determine the value of the lab space without determining the whole ecosystem. This is a very tangible example that we’ve had here, thinking about an investment where we’ll transform offices into labs in one of the big biotech hubs in the country. Then we said, we really need to know about the capital structure of all the companies who may be leasing the labs. Is it publicly funded? Is it venture-capital funded? Then we also need to know a bit about the science. That discussion took place here. We just held a life-sciences roundtable, a really enjoyable afternoon where we had entrepreneurial faculty from Harvard and Stanford—all of them had set up companies or had developed patents. We had venture capitalists from the U.S. and China, all of whom had invested in mid- to late-stage biotech companies. We had public investors from the U.S. and India who had all invested in either late-stage or pharmaceutical companies, and we had real-estate developers from the east and west coasts who had all developed lab space in places like Kendall Square or South San Francisco and San Diego. That kind of interaction is essential in order to really understand the field. It’s important for HMC but also for developing connections with external constituents. [Professor of bioengineering] Don Ingber, the head of the Wyss, was there; I sat next to him. He said, that was fascinating, and I said, not as fascinating as it was to me. The discussion had a tangible effect on whether we invest in this substantial office building that we can convert into wet lab space near a cluster where demand for labs is incredibly high, but we need to be sure that the leases are going to be signed by mid-stage biotech companies whose funding will not dry up. HM: A fact question. Obviously, Andy Wiltshire left and some other people have left. When people left in the last month, you said their portfolios had been unwound. Should we expect big changes in investments in natural resources or timber because of those departures? Stephen Blyth: There’s a distinction. Andy retired. He and I are good mates—we go climbing each year, a big mountain out West. In July, we’re going to climb again. First of all, the culture here is changing, the strategy is changing, the management structure is changing, the investment process is changing, the asset-allocation process is changing, and the compensation scheme will change. We are inevitably going to have change in personnel. We’re going to add people. I’m not sure whether there will be more turnover. In natural resources, Andy retired and Alvaro Aguirre-Simunovic [natural-resources portfolio manager] resigned to pursue his own endeavors. In natural resources itself, I’ll say the following: Natural resources plays an incredibly important part of the Harvard portfolio for two economic reasons and one structural reason. One is it generates real return. Second is it’s highly uncorrelated with other risk factors: obviously trees grow when stocks go down and trees grow when stocks go up. Almonds grow when stocks go down and then when they go up. Those two elements make it a very attractive asset class if suitably priced. Third, the structure of our capital means that investors can really only be involved in natural resources if you have a long-term portfolio period because once you plant the trees, depending on how you rotate them, you may want to take out thinnings, you may want to do it for pulp, but if you want to do hardwood, that’s decades. That will be important. However, there is an opportunity now for us to reassess the natural-resources portfolio and that’s what we’re doing, given the departures. We’ve lost talent, so we will add people into natural resources. We will be hiring for natural resources and we will have a significant natural-resources portfolio. Are there areas you want to concentrate on? Are there areas you want to de-emphasize? Is there some diversification we ought to be doing? Is this portfolio right for the future? Actually, it was a good opportunity to assess the portfolio as it is. Are there areas you want to concentrate on? Are there areas you want to de-emphasize? Is there some diversification we ought to be doing? Is this portfolio right for the future? It’s done very well for us over the last 10 years. As you can see from the numbers, the returns have been much lower over the last five years, but over the last 10 years, natural resources has generated 9.7 percent and the endowment 7.6 percent, so you can’t say it’s a low-returning uncorrelated asset class. Certainly, there are two things that are relevant to natural resources looking forward. One is low commodity prices, and the second is low inflation. If we’re in a deflation environment and you have protection against inflation, then it’s not going to perform. That will be a reassessment in that portfolio. There were two departures, Satu Parikh [in commodities] and Marco Barrozo [in fixed income], both from the public side on the trade floor. We may replace them in-kind; we may replace with someone different. They’re both talented people. Marco I hired eight years ago, Satu I hired four years ago. HM: Do you anticipate HMC maintaining the hybrid model with 40 percent or 50 percent of funds managed internally and the rest externally? Do you still think you’re getting the same kinds of cost advantages from internal management that HMC has reported historically? I ask that because language to that effect was missing in the report this year when it’s been there all the time. Stephen Blyth: I tried to change all the language. I was hoping much would be different from last time. Right now, we have just under 60 percent of our assets managed externally. We have approximately 15 percent what I call direct investments, where we own assets essentially ourselves. And we have about 25 percent of the assets managed on this trade floor. That has not shifted much in the last two or three years. The direct component has gone up, certainly, driven by direct real-estate investment, which has been a very successful venture. As a statistician, I smile because if you look at the last eight years, endowments that have a hybrid model versus endowments that did not have a hybrid model, the one endowment with a hybrid model was bottom quartile against the other 10. That would argue against. However, of course, in the period from 1995 to 2005, which were the years where Harvard was top quartile, it had 70-plus percent of its assets managed internally. These arguments are of course way too simple. It’s also the case that institutions with assets under management of $40 billion-plus, where we are, are building up internal capability because they cannot get appropriate scale or quality with external managers. I’m thinking about the Ontario Teachers’ Pension Plan fund or the Canadian Pension Plan. Obviously CPP’s assets are now much bigger than ours, maybe $C270 billion—I believe they have gone from a handful of investment staff to a thousand investment staff, with a significant proportion of that managing money internally in a similar way that we do, with direct investments and with internal capabilities in public markets to generate out-performance. At the recent Harvard Business School asset-management conference, some people said, you should do way more internally, and some people said, you should do way more externally, which would probably mean we’re about right. There is a conceptual issue: at a certain scale, is it necessary to have internal capability because one can’t get scale in external management? At the recent Harvard Business School asset-management conference, some people said, you should do way more internally, and some people said, you should do way more externally, which would probably mean we’re about right. I have no target, I’m agnostic about target. There’s no, “We want to get this amount internally” or “We want to get this amount externally.” This is an obvious statement: we just want to make sure we have the best investors in everything we’re doing. If we have an external manager who’s not good enough, we're going to redeem. If we have an internal portfolio-management team that is not good enough, we will have to upgrade. It’s symmetric. I strongly believe that if we have the appropriate relationships with external managers and direct-investment capabilities and internal-platform capabilities, that must stochastically dominate—i.e., be better in all states of the world than just having external relationships, since we have the option to do internal and to do direct. However, that only holds if having an internal platform does not deteriorate or diminish our ability to develop excellent relationships with external managers. It’s a question of culture; it’s a question of time allocation. One thing I’m very aware of, having come up from the internal public side, which has done well and I do believe adds value, we want to assure that the amount of time my executive team, I myself, and the investment committee, think and spend on the internal capabilities does not diminish our ability to execute in [external] manager selection (right from your first question). I don’t think it should. I think there are other factors that have affected our manager selection, such as turnover and so on and these interrupted relationships. The fixed-income team here has had a tremendous track record since HMC was formed. Dave Mittleman and Maurice Samuels [highly successful, and highly compensated, HMC domestic and foreign fixed-income managers a decade and more ago] had a tremendous track record. The international fixed-income portfolio here has had a tremendous track record over the last nine years and continues to do so. It’s outperformed its market benchmark by 650 basis points per annum for nine years in all sorts of market environments. If those people were doing that job with the same amount of capital, but sat somewhere else externally, they would be paid more; that’s just factually correct. The reason it’s not in my letter is that ultimately we have to look at the overall performance of the fund, and I think it was you who made the totally valid point—it’s all very well if our cost of management is low, but if our returns are actually lower than others, then our gross investment returns [before investment-management expenses] must have been even lower. It’s totally true. But it is also true that we have cost benefit and many other advantages that come from having assets managed and owned by Harvard, like flexibility, liquidity, et cetera. HM: But it’s net returns. Stephen Blyth: Net returns. Ultimately, it’s all about those investment objectives. I can’t say, “I’ve missed our investment objectives but I’ve saved this amount of money in management fees,” right? Our investment objectives do not include minimized management fees. They’re not there. But it is true that our returns in fixed income would have been lower if we’d been managing externally. Equally, our returns in direct real estate would have been lower if they’d been managed externally. That’s even with the head of real estate who will be paid well and the heads of fixed income who will be paid well. Their compensation would have been much higher outside.